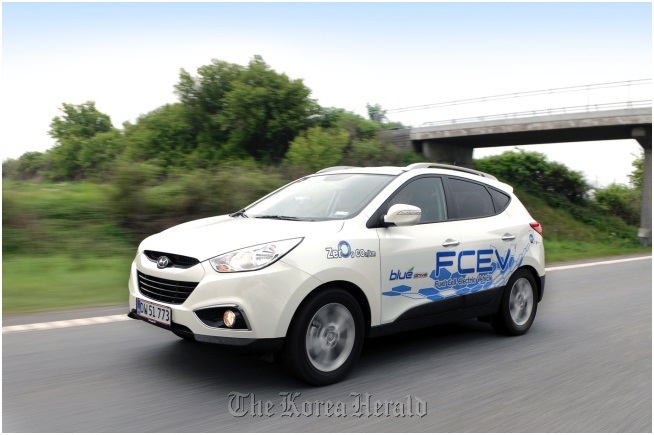 The Hyundai Motor Group is planning to rank second in the global eco-friendly car market by 2020. To this end, the company is focusing on hydrogen fuel cell vehicle R&D at the Gwangju Creative Economy Innovation Center. 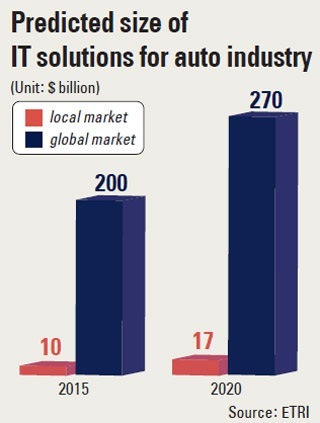 At the same time, it is going to raise 177.5 billion won (US$162.3 million) in funds with the government for startups in the auto industry and better business management at small and medium enterprises. The funds include a so-called hydrogen fund of approximately 15 billion won (US$13.7 million), which will be spent on the hydrogen fuel cell industry. Industry-academic idea collection, expert consulting, and mentoring are scheduled, and stations are set up for LPG and CNG-based hydrogen and electric power generation, sale, and storage. Joint research activities and programs will be underway as well to replace imported hydrogen vehicle parts with domestically-developed ones. Specifically, these will cover the development of separation membranes, base materials, storage, and transfer techniques for fuel cells and external power transmission technology, and so on. According to the Nikkei BP Cleantech Institute, the global fuel cell market is estimated to reach 400 trillion won (US$366 billion) in 2030. The hydrogen fuel cell industry of Korea is expected to exceed 107 trillion won (US$97.9 billion) by 2040, and they expect to create about 175,000 jobs and produce 23.5 trillion won (US$21.5 billion) of goods. An ICT-based advanced traffic infrastructure forum, in which the government and industries are participating, was officially launched for the first time in Korea. Various kinds of traffic big data, owned by the National Police Agency, etc.,will be opened to the private sector, creating a new industry. Government agencies like the National Police Agency and the Ministry of Science, ICT & Future Planning, and industries including Hyundai Motor Company, SK Telecom, S-1 and the General Insurance Association of Korea, are participating in the ‘advanced traffic infrastructure forum.’ The foundation ceremony and the MOU signing ceremony were held at the K Hotel on December 9. The forum will combine ideas in the private sector with the public IT infrastructure in line with the creative economy and the government 3.0 policy, and create a new market. The forum will have four subcommittees for technology utilization, traffic safety, social safety and policy development. The technology utilization subcommittee will find ways to develop and utilize various services based on the Urban Traffic Information System (UTIS, http://www.utis.go.kr/), which was implemented and operated by the National Police Agency. Representative examples are the digital tachograph (DTG) data automatic transmission system, customer management service based on automatic transmission of vehicle diagnosis data, the logistics management system for various commercial vehicles including vehicles carrying hazardous materials, automatic update of maps and black box image transmission, mobile communication networks and UTIS bundled products. Hyundai Motor Group on Monday announced a new investment plan worth 1.12 trillion won ($1 billion) as part of its efforts to elevate its competitiveness in next-generation automotive material development. The Korean auto giant, which owns the Hyundai and Kia brands, said it would build two factories that produce specialty steel and high-quality iron powder ― the two key materials used in vehicle engines and transmissions. Hyundai Steel, the second-largest Korean steelmaker and a Hyundai affiliate, plans to complete the construction work of the specialty steel plant by September near its Dangjin steel mill in South Chungcheong Province. Its production is scheduled to start in the latter half of this year, with an annual output nearing 1 million tons. KAIST’s Industrial Design Professor Suk Hyung Bae’s portable sound camera design, made by SM Instruments and Hyundai, has received a “Red Dot Design Award: Product Design,” one of the most prestigious design competitions in the world. If you are a driver, you must have experienced unexplained noises in your car. Most industrial products, including cars, may produce [abnormal] noises caused by an error in design or worn-out machinery. However, it is difficult to identify the exact location of the sound with ears alone. This is where the sound camera comes in. Just as thermal detector cameras show the distribution of temperature, sound cameras use a microphone arrangement to express the distribution of sound and to find the location of the sound. However, existing sound cameras are not only too big and heavy, their assembly and installation are complex and must be fixed on a tripod. 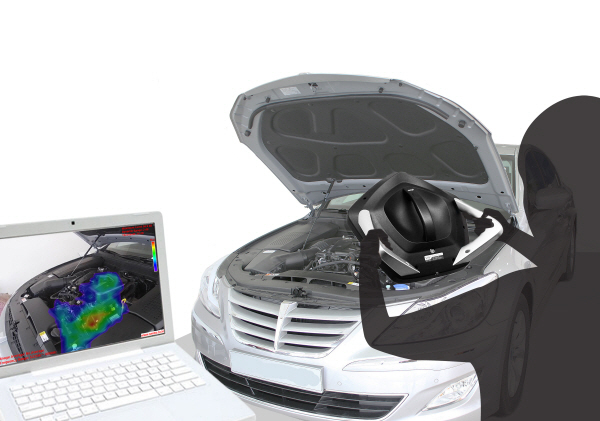 These limitations made it impossible to measure noises from small areas or the base of the car. The newly developed product is an all-in-one system resolving the inconvenience of assembling the microphone before taking measurements. Moreover, the handle in the middle is ergonomically designed so users can balance its weight with one hand. The two handles on the sides work as a support and enables the user to hold the camera in various ways. Thus, users can easily measure small areas or the bases of xobjects. For full article, see KAIST. Chung Mong-Koo, Chairman and CEO of South Korea’s Hyundai-Kia Automotive Group said the group will pursue more aggressive investments this year to secure future growth engines. “The domestic and overseas markets will face turmoil this year due to the eurozone fiscal crisis and global economic recession. So we will enhance brand innovation by raising the quality of our vehicles,” Chung noted in s business report on the Kia Motor’s shareholders meeting Friday. “The group will concentrate more on its investment in developing new growth engines,” added Chung. “More investment will be made to boost our R&D activities in the green cars and electronic control units.” Kia set its sales goal for this year at 2.75 million units, higher than last year’s 2.72 million units and will focus on sharpening its competitive edge. Like a regular SUV, Hyundai’s fuel-cell-powered Tucson lets you cover about 370 miles on a single tank. Its silent power system and familiar six-speed automatic transmission make highways and city streets quieter than ever. In fact, there’s not much you can’t do with the hydrogen-cell Tucson that you can’t do with a regular Tucson ― except fill’er up. And, for the moment, afford’er. This isn’t the model found at dealerships. Not yet. 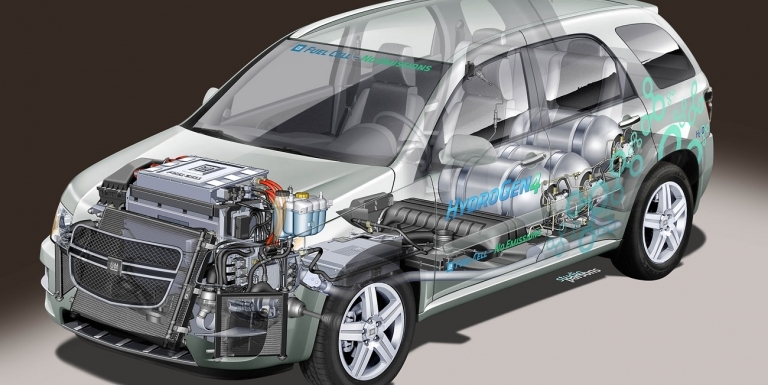 But Hyundai is already leasing hydrogen-powered vehicles to city fleets, Copenhagen for one, and it plans to begin marketing to consumers by 2015. Punch the ignition button, tap the pedal and you’re off. A comforting, jet-like whirring steps up with the acceleration. The motor is responsive. The Tucson chassis and suspension handle well. And the interior creature comforts ― love the heated seats ― make it competitive with any conventional gasoline-burning vehicle in its class.